This set the shutdown timeout to 2 sec instead of the default value (20). This is a legendary tool developed by the author of The Web Application Hacker’s Handbook: Finding and Exploiting Security Flaws (2nd edition). Unfortunately there is no native Mac Os X version but Corsaire packed one. Since they updated the site, the link to download it provided in the aforementioned book is broken, so I will provide a new working one of the recently released version 1.5 1.6 of Burp Suite Free. All rights reserved to Corsair and Portswigger. is now outdated (it also requires JDK 6, which is no longer supported). See also here for a [much less powerful] alternative. Quicklook is a beautiful and powerful feature of Mac Os X (take a look here to know what is capable of) but it is somewhat weird that it doesn’t allow text selection. NOTE: this trick stopped working with Mac OS X 10.11 and later. There are Macs without disk drives. You can access CD/DVDs from another Mac over the network allowing remote disk. NOTE1: if you want install very nasty apps then you need WP7 Root Tools. NOTE2: Unlock & Interop Unlock works on WP7 Tango too. NOTE3: to lock device again set DeveloperUnlockState to 0 (zero). You are accustomed to incomprehensible command line tools??? It’s all about friendlyness!!! 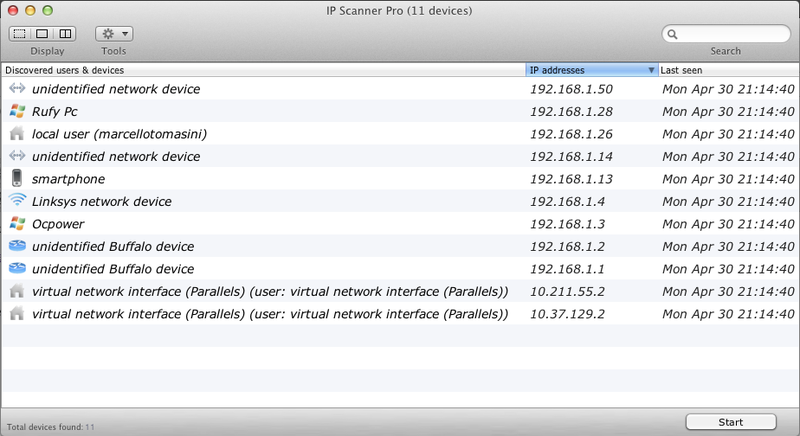 You can ping, wake up, insert into whitelist, etc all the devices found with just one click. NOTE: I have hidden MAC address. MAC Address is a unique identifier of 48 bits assigned to network interfaces. This Address is unique in the world, so it does identify you, everywhere. From a Security & Privacy perspective this is not good at all!!! Go to Network System Preferences, select active interface and push Advanced… button. In TCP/IP tab click on Renew DHCP Lease button. You should now see your new MAC Address in Hardware tab. NOTE: you can set Configure: Manually in Hardware tab to manually set MAC Address and avoid using Terminal. NOTE2: if you do not renew DHCP Lease you may loose network connectivity. NOTE3: if you have set MAC Address through Terminal it will be restored to it own default after reboot or shutdown. SSD are based on NAND Flash which have limited writes life. Currently 25nm chips support 3000-5000 cycles then they become read only. This limitation makes very important avoid unneeded writes on the disk. Moreover power save technologies can give some trouble (of course on SandForce controllers). Enter admin password and let’s do it the magic. This will prevent GB of writes every time you close the lid of your notebook. both on Battery and Power Adapter tabs. This will prevent disk freezes and beachballs. If you have a SATA 2 interface and a Nvidia chipset on your Mac, check to have 3 Gbps Negotiated Link Speed. Go to Serial-ATA section in System Information app to take a look of your disk(s). This will ensure optimal performance of SSD. NOTE: there are more Hacks, like enabling TRIM for non Apple supported SSDs but they give more troubles that other therefore I advice against to engage in similar enterprises. Open telephone and call ##634#. MFG use a password to enter in secret menu. Type 277634#*# and click ENTER. Enjoy and remember: “From great Power comes great Responsibilities”.